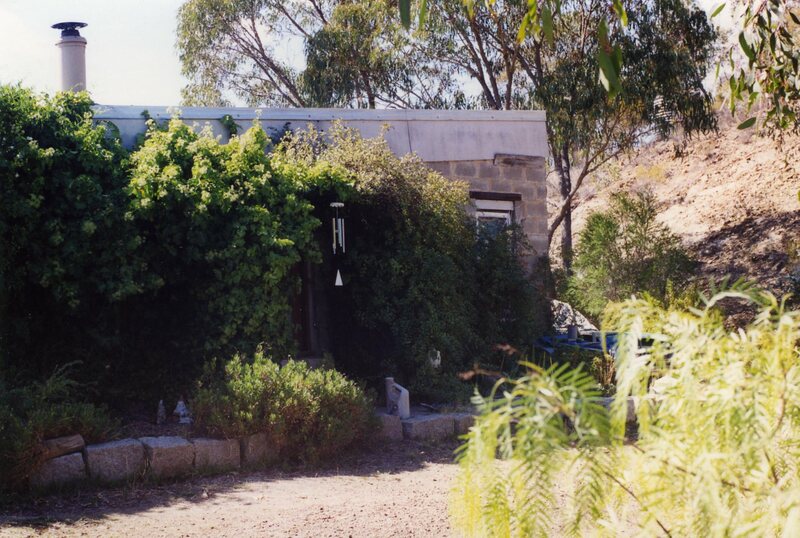 My bushlands site has had various identifications since I bought it in 1985. I thought that no one had ever lived on it before. 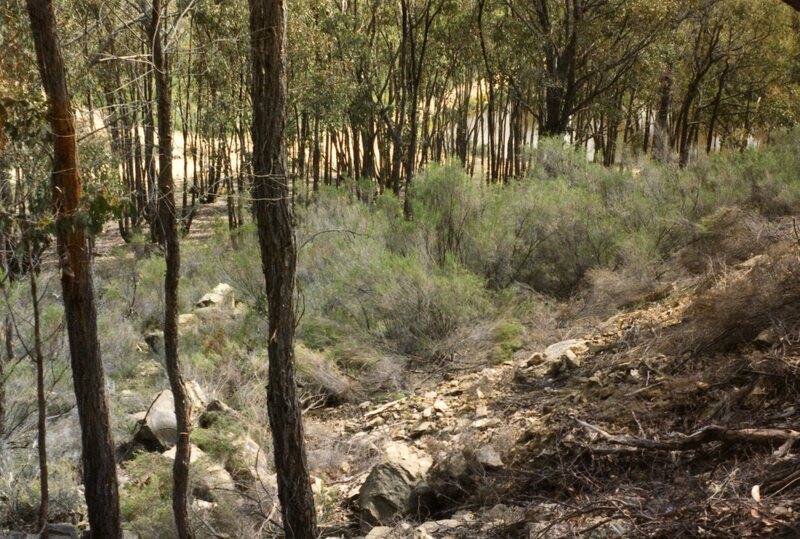 Now I have come to realise that the original people lived here for many generations, the Dja Dja Wurrung Peoples, when it was a gentle forested area with small creeks wandering down the hills to feed what the newcomers would name the Loddon River system. 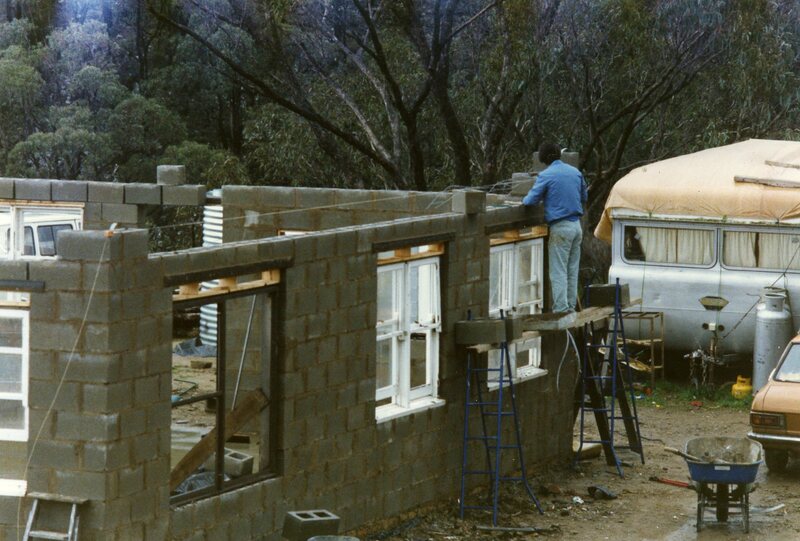 After the Bushlands were subdivided in the seventies, the blocks were prepared for sale by building driveways, dams and house sites. To our Council my block started life as Lot 4, then it became #126, and now it is #46 Miners Hut Road, Chewton, although the CFA still call it “#118, off Cemetery Road”. 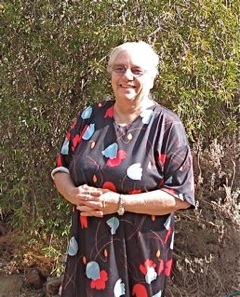 In 1985 I was living in a little cottage in Campbells Creek which was in need of repairs that I could not afford. So I decided to sell it, and buy back into the area that I grew up in: Chewton. I couldn’t afford to buy an already built house. Many people were building their own homes and I asked my children if they would help me to build in the bush. They agreed — bless them — as long as they didn’t have to make mud bricks! Bush lots in the “Bushlands Estate” were being advertised at reasonable prices, so I went to look at several different sites. I was surprised at the beauty of the area. When I grew up, this was regarded as ‘just bush’. To me it was a wilderness, and I never went there in my many childhood wanderings. On my bike I often rode around it; along Golden Point Road to the Koala Park, then to Elphinstone, back past Tunnel Hill and home to Pitman Street. 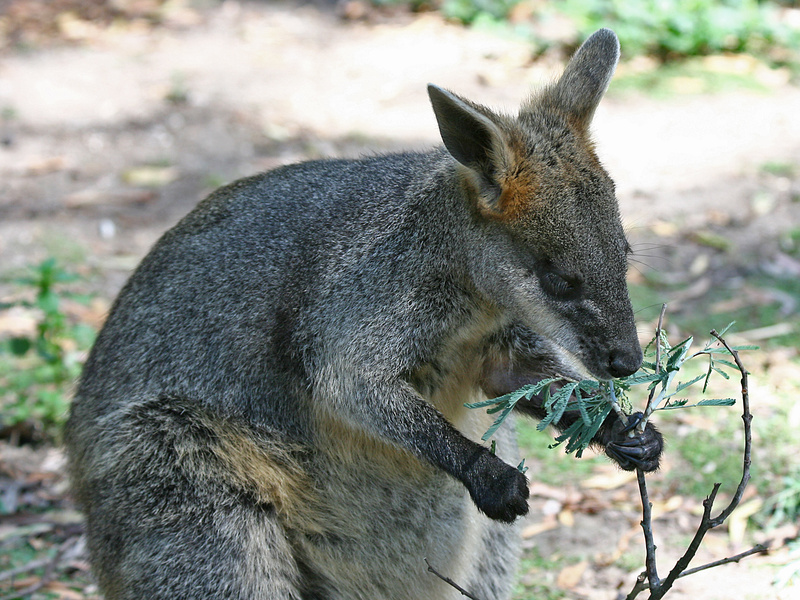 When I ‘went bush’ I used to walk across the railway tracks into the bush there, where, if I stayed still and quiet I would sometimes see the bush creatures that I loved so much. The first block I liked was being sold as ‘with a levelled building site and a dam’. However, there was no dam, and the lot was very steep all over! So, eventually I went back to the block which is now my home: Lot 4. I had previously dismissed this one because the level area had been chopped out of the side of the hill. This created a cliff above the house site at the back, then a very steep slope on the other side, and I worried that the grandchildren might fall over the edge. 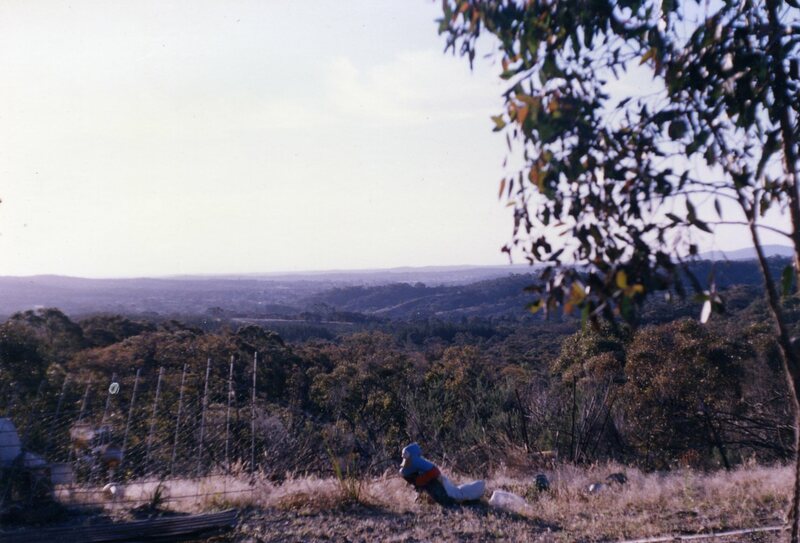 However, on my return when I fought to see the view through the ‘coffee bush’ which had completely overgrown the site, I fell in love with the wonderful vista. In the distance were the Pyrenees Mountains, Mount Franklin and Mount Tarrengower. I realised that the level area for the house was a good ¼ acre and I decided the grandkids would have to learn NOT to go near the cliff! So … I sold the Campbells Creek house for about $26,000 and paid $8500 for the land in the Chewton Bushlands, and bought a more reliable car to cart myself to Castlemaine and back. For 18 months I lived in a caravan at the back of the level area but I was terrified for the first few nights when the August wind threatened to blow me off the cliff and down to the road below. The boys’ solution was to dig the wheels of the caravan into the ground so the wind couldn’t get under it and lift it off! Problem solved! I remember how wonderfully safe I felt the first night I slept in my solid, unmoving Besser block home. For several years I used 12 volt batteries to listen to the radio, and watch the little black and white TV. My lighting was kerosene lamps and I had a gas stove and refrigerator. I now have two solar panels and a converter and can run a colour DTV and a computer. So, I am in touch with the world with the internet. Through the years, I have been thrilled by the wonderful wildlife, which share their habitat with me. From the timid wallabies which I fed during the drought, to the various snakes who visit my front verandah during the summer months, and of course, myriad birds of all kinds who bring me music and colour to my garden. My only sadness is that many, many creatures have disappeared as more and more humans moved here and brought their precious pets, their fear of snakes, and lack of natural knowledge to this place which has taken more than a hundred years to renew itself from the devastation of the gold rush era. To complete my wellbeing, and with the help and support of the beaut neighbours around here, I have finally been able to get a Trust for Nature Covenant, so it is safe from future developers’ machinations. This entry was posted	on Sunday, February 17th, 2013 at 7:25 am	and filed under • Bushlanders, Our lot. You can follow any responses to this entry through the RSS 2.0 feed.